Old buildings may seem boring and useless to some people, but those of us that love them know that while many buildings can be very interesting in their design and history others are just downright fun. Take for instance, the Ott Hotel in Liberty, Texas. Built in 1928 to attract travelers on the nearby Texas & New Orleans railroad and the Old Spanish Trail highway the hotel still serves travelers (and the curious) today. It is also home to several spirits that have garnered much attention over the years! In the early 1900's the railroad line cutting through Liberty boosted the community into a center for trade, timber and agriculture. The discovery of oil in nearby fields further prompted construction of buildings for restaurants, stores and hotels, including the Ott Hotel built by John and Sallie Ott. The hotel's location adjacent to the railroad tracks and close to the Liberty depot made it popular with rail passengers. Automobile tourists found it a convenient place to spend the night as well as those with business to conduct at the nearby Liberty County Courthouse. The Ott family owned the hotel until 2002 when it was sold to Kelly and Susan McCain who restored the hotel to its original 1928 appearance. Although, truthfully, from what I saw I can't be certain it is authentic; however, it is fun and delightfully quirky. Today it is still in use as as a hotel and residence and their Facebook page indicated there are weddings held here from time to time. The hotel doesn't have a website and there is very little other information available except for numerous reports of its supernatural activities. In 2005 the Ott Hotel was designated a Texas Historic Landmark. Many famous people have stayed here including John Wayne, Dale and Roy Evans, and Dan Rather. At least 20 people are said to have died in the hotel with some of their spirits still residing here. The property is a certified "haunted property" having had over 50 paranormal investigations conducted. The day I visited I didn't feel a chill or anything creepy, perhaps the spirits just didn't want to deal with me! The hotel lobby features an original front desk and other antique memorabilia. Pictures of Liberty through the years line the first floor hallway. From time to time the hotel offers tours and I'm hoping to catch one, but for now it was a fun find! On this day in 1836 a pre-dawn attack by Santa Anna's forces breached the walls of the old mission compound and the defenders inside were all killed. Four days earlier on March 2, 1836, Texas had declared its independence from Mexico while what has come to be known as the Battle of the Alamo had been raging since February 23rd. Approximately 200 men lost their lives when the Alamo was captured; their remains are now interred at nearby San Fernando Cathedral. A few weeks later the Texan forces under the leadership of Sam Houston would surprise Santa Anna and with the rallying battle cry of "Remember the Alamo" claim victory after an 18 minute battle. The Mexican forces would surrender on May 14th, but would maintain their stance that Texas was not independent and skirmishes would result from time to time. Texas would join the Union in 1845. To read a chronology of the history of the Alamo click here to visit the Alamo's website. Just to note I've kept this post short to focus on the commemoration of the fall of the Alamo, but am now planning to do some more posts relating to the Alamo. 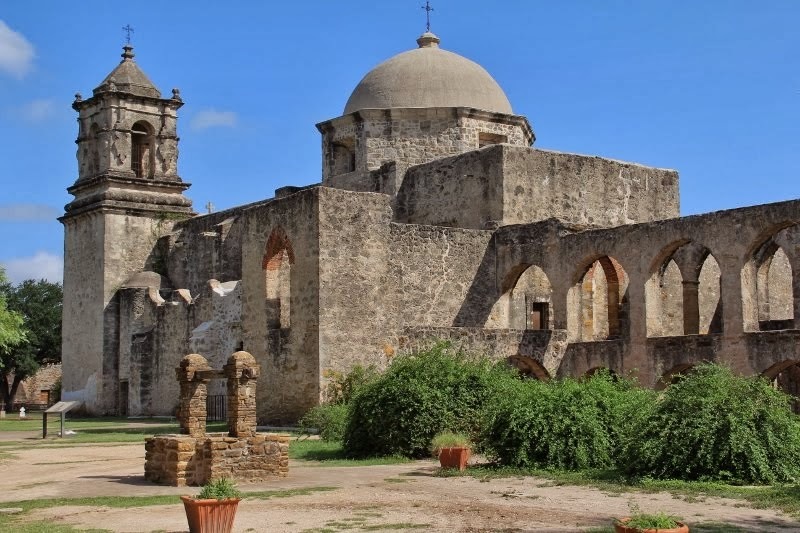 It has played a vital part in San Antonio's history and while often regarded as a "tourist must visit" site deserves recognition of its entire history. A previous post discussed the history of The DRT Meeting Hall (Alamo Hall) located on the Alamo grounds. For many years The Wedgwood apartment building was known as a moderate priced, fashionable residence for senior citizens. The blue, brown, and beige "Y" shaped building located in the City of Castle Hills was a familiar landmark on the northside of San Antonio. I never went in the building, but knew people that lived there and they considered it to be very pleasant. In December 2014 fire broke out on the third floor and five seniors lost their lives; a sixth would die later of natural causes. 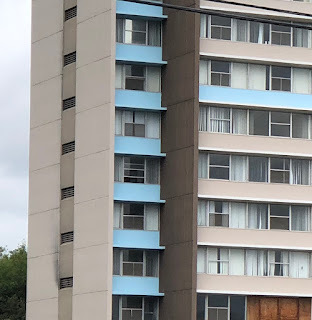 The other 250 or so residents were displaced due to major smoke damage; the building was closed after substantional internal demolition took place. 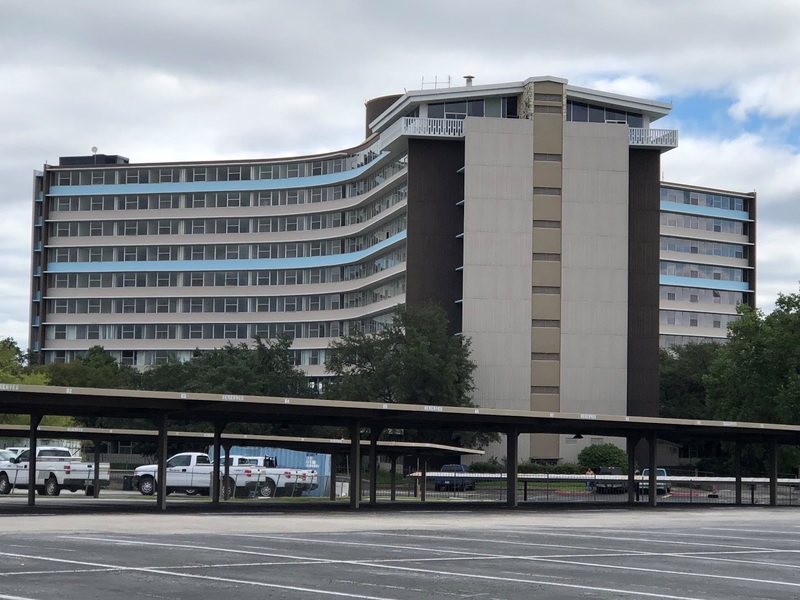 The cause of the fire was never determined; however, the building had been completed prior to current fire codes and the only fire sprinklers were in the basement. Second and third floor windows boarded up after the fire. East side of building. September 2018. Dallas architect Walter W. Ahlschlager designed both the San Antonio Wedgwood and its Dallas twin, also named The Wedgwood, with plans that never materialized for a third building in Houston. The almost identical buildings were designed in what is described as "midcentury interpretation of the International Style". The Dallas Wedgwood is now known as The View at Kessler Park and has been renovated. Contruction of the Castle Hills Wedgwood began in early 1964 with T.C. Bateson as general contractor and a projected cost of $4.5 million; it would open to residents in October 1965. “complete residential apartment building that puts the dweller above the skyline and provides him with wonderful scenic views, in luxurious comfort and convenience.” San Antonio Light, October 2, 1965, special section. The complex also featured a 49,000 gallon swimming pool, gardens, a lighted waterfall and a putting green. A spacious parking lot surrounded the complex. Note smoke damage on left of building. Renovation in progress with gutting of building. It is interesting to note that the building's almost 8 acres of land was originally part of a 320-acre tract awarded to Jethro R. Bancroft for his service during the Texas Revolution. The land was divided and sold many times over the years. Post World War II saw the movement of Baby Boomers northward and the area was rapidly developing. Concerned citizens incorporated their community and formed the City of Castle Hills in 1951. Continued development of the city's highway infrastructure encouraged the construction of homes and businesses in this area in addition to newly fashionable high-rise apartment homes such as The Wedgwood. and rock garden entryway visible lower right. In 2016 the property was sold and the new owner, Pat Bernaki, is currently renovating the building using State and Federal tax credits made possible after the Wedgwood was accepted into the National Register of Historic Places in early 2017. An article in the San Antonio Express News on August 23, 2018 states that he intends to offer moderately priced senior housing at prices similar to those before the fire. 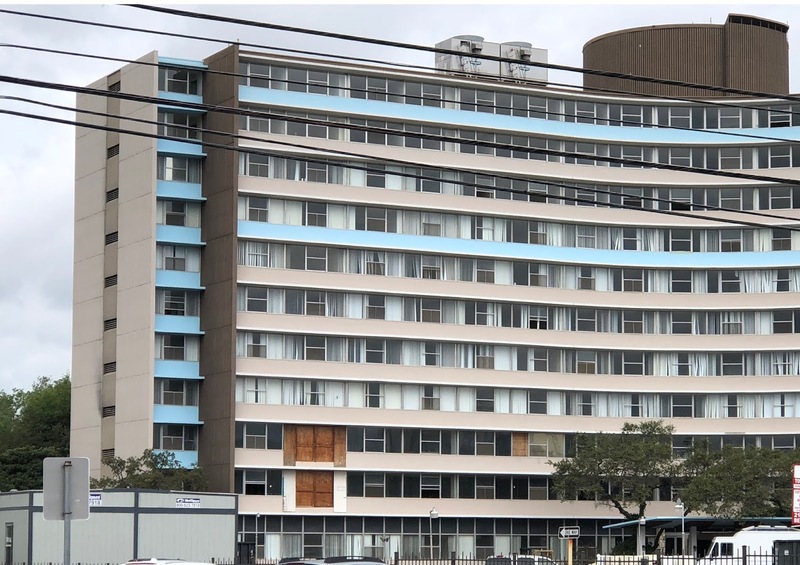 After the tragic fire the State Legislature passed a law that requires Bexar County high-rise buildings with elderly or disabled people comprising a majority of residents to be retrofitted with sprinklers by 2027. In addition to retrofitting the building with the required sprinker system Bernaki is also working with City officials to determine what went wrong at the Wedgwood and additional ways to add safety to the building. Expected re-opening is late 2019. A glimpse of the remains of the garden/walking path area visible from a nearby parking lot. 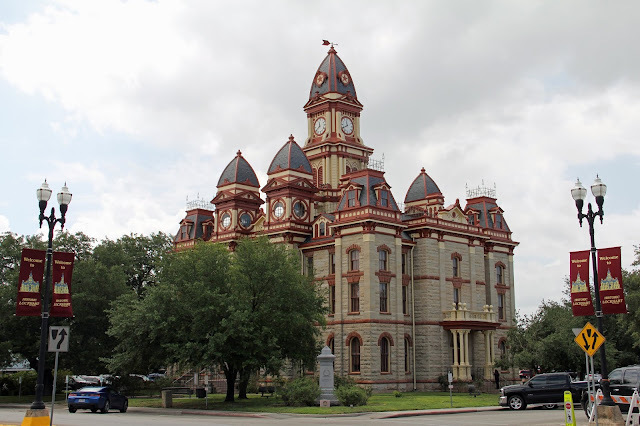 My first trip to Lockhart was with the intent of exploring the Caldwell County Courthouse. I had parked on the square and was crossing the street to the Courthouse and glanced to my right for oncoming traffic when I saw this building; I knew immediately that it had been a movie theater at one time and immediately left the square to explore! 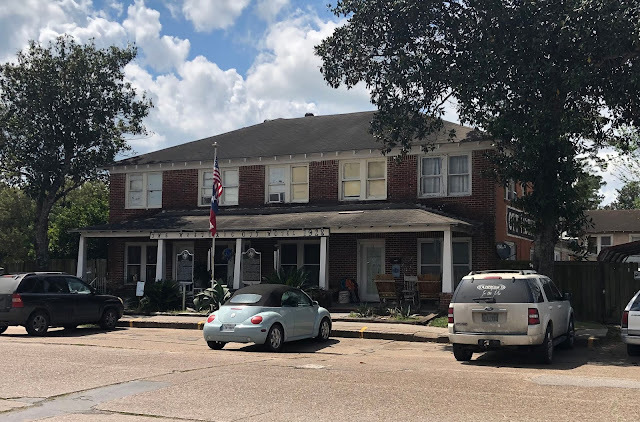 Located on a side street off the square, the Gaslight-Baker Theater has been providing citizens with entertainment since its opening night on October 29, 1920. According to the theater's website there were two showings of "Old Kentucky" starring Anita Stewart and an estimated crowd of 1,500-2,000 people attended. At the time of its 1920 opening the theater was proclaimed by many to be more opulent and modern than many others in the state. Sadly, the theater underwent a remodeling in the 1930's and then another more extensive remodeling in the 1950's that give the theater much of its present day appearance. The pinkish ceramic tile was added to the lower exterior, as well as the angled front wall and enlarged marquee. The enclosure of the lobby probably dates to this remodeling. The Gaslight-Baker also owns the building next door (barely visible to the right of the theater in the first picture) where there offices and box office are now located. Mr. A.D. (Colonel) Baker had built this theater after his first theater burned; he would continue to own and operate it until his death in 1936. The Baker Show Company owned and operated the facility until 1959 when it was purchased by the Valentine family. The theater remained in operation until March 1984 and sat vacant until 1997 when the Lockhart Community Theater acquired the building and converted it to accomodate live theater productions. Their first production,"Steel Magnolias", opened in October 1998. 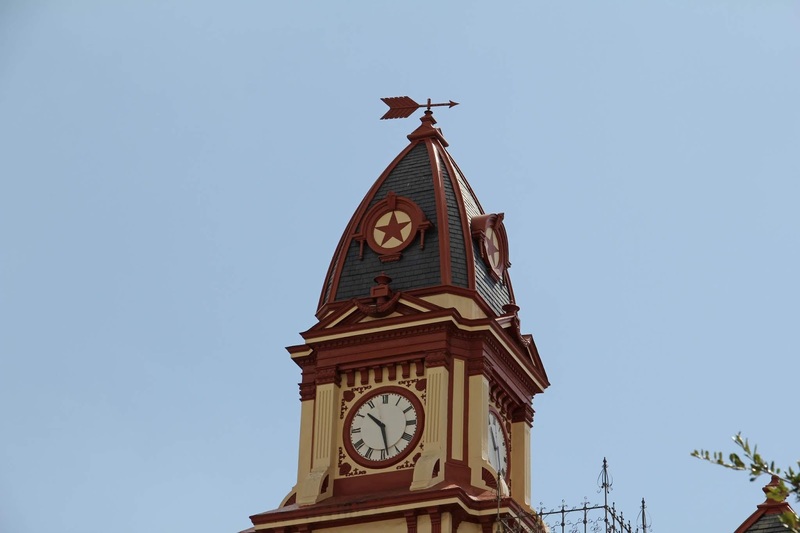 Ten years later LCT Baker Theater merged with Lockhart's Gaslight Theater to form today's Gaslight-Baker Theater and continues to offer year-round productions. The theater is part of the Caldwell Courthouse Historic District listed on the National Register of Historic Places in 1978. The original vaudeville stage, portions of the 1920s interior, 1935 Grande Drape and Proscenium Arch remain intact. When the two theater groups merged the exterior of the building was refurbished, the lobby updated, and the balcony eventually was re-opened as a seating area. Interestingly, Mrs. Valentine had taken out all the seats and put in shag rugs for theater goers to sit on sometime in the 1970's. 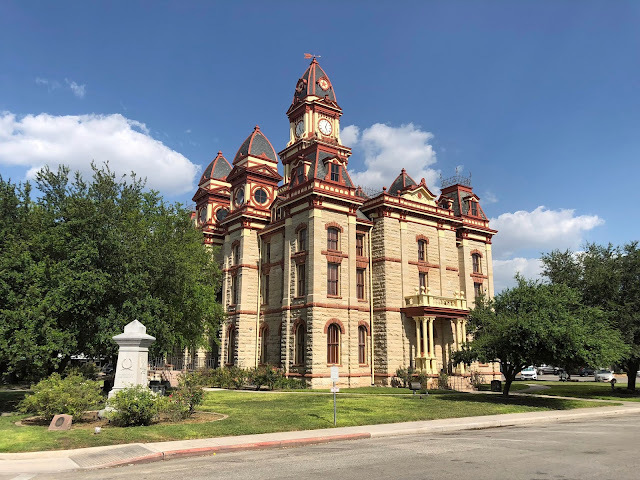 I returned to Lockhart recently to see the current production, The Lion in Winter, which did not disappoint. The staging and acting was outstanding and the theater warm and welcoming. The evening tour group gathered on the front porch to begin with a brief history of this 1876 Italianate home located in the King William neighborhood. As our guide unlocked the front door she told us that we would feel like we were stepping back into the 1800's, but really we were stepping into the 1970's. And indeed, as a child of the '70's I did see the truthfulness of the statement especially in the kitchen with the brown appliances and the elegant draperies with ball fringe trim! This home's history really does begin in 1967 when Walter Nold Mathis purchased the derelict property. Hard times had come to the King William neighborhood following the disastrous flood of the San Antonio River in 1921. The elegant homes built by mostly German immigrants in the late 1880's were flooded and many owners moved northward leaving the homes to be neglected or divided into apartments. The neighborhood declined until a core group from the original families were successful in obtaining protective zoning. 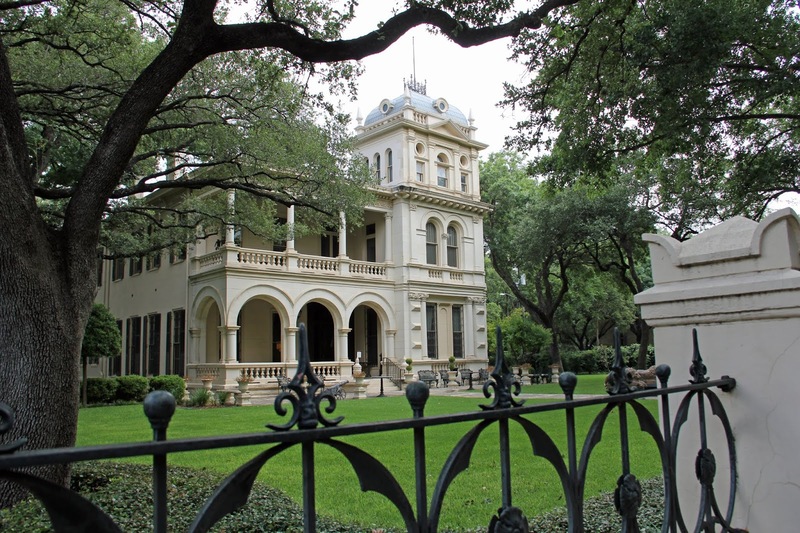 Shortly after Mathis bought the home the King William Association formed and soon the neighborhood was listed in the National Register of Historic Places, making it the first listed historic district in Texas. To read more about history of the King William area click here . The home is also listed in the Historic American Buildings Survey (Survey number: HABS TX-3225). Hardware merchant Russel C. Norton and his wife hired architect Francis Crider to design a one-story four room limestone house in 1876 and added an identical second story to the home before selling it in 1881. During the 1880's Edwin Polk added a Victorian style two-story brick wing and wooden gallery to the house as well as several outbuildings (no longer extant). An exhibit inside the home credits Colonel Isaac Pryor and his wife, Myra, with the addition of the double front porches and Italianate style tower during their ownership from 1896-1901. However, HABS indicates that these were added by the Polks. The tower is accessible from the front second-story room via a spiral staircase. In addition to giving the home a decorative touch on the exterior it is possible the tower was used to pull out the hot air from the lower floors. From the 1920's until Walter Mathis bought the home it was divided into apartments and the rear porches converted into a kitchen and bathroom. Like many of the once grand homes the property suffered from general neglect. Mathis was a devoted preservationist who, interestingly, had been displaced from his existing home due to the impending construction of a new freeway. He bought the derelict home in 1967 and restored it to the original floor plan using modern construction materials and some of the salvaged architectual details. A year later the King William Street Historic District would be approved and the neighborhood would revive. He named the house Villa Finale as he knew this would be his final home. During the forty years he lived here he filled would fill it with art and decorative pieces from his international travels and his extensive collections. After spending two years on the renovation of his home Mathis purchased and partially restored many surrounding homes and sold them to preservation minded individuals. 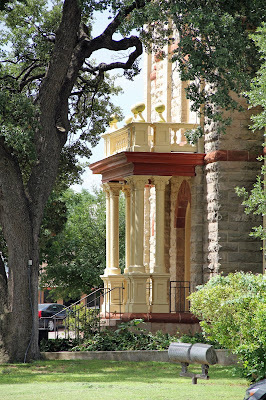 He was a major influence on the renaisance of the King William Neighborhood. Villa Finale is now owned and administered by the National Trust for Historic Preservation. 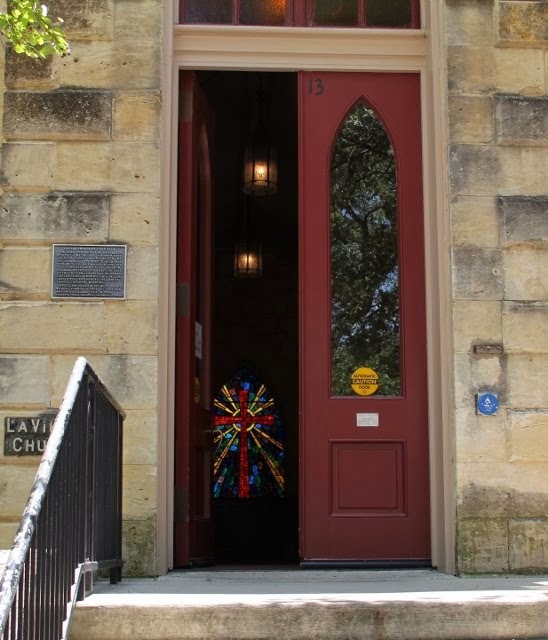 Located at 401 King William St., San Antonio Texas. Call before visiting to make a tour reservation. For more visitor information visit Villa Finale. Part 2 will feature the incredible interior and grounds. For the last 50 years the Tower of the Americas has been a distinguishing landmark of the downtown San Antonio skyline. Built as a part of the 1968 HemisFair it has remained an integral part of the community; most of HemisFair is long gone and soon new construction will bring further changes to this area now known as HemisFair Park. From the base to the top of the radio tower the Tower measures 750 feet. An elevator makes continual runs to the restaurant, bar, and observation deck, but if you feel challenged you can take the stairs - all 952! The views from the elevator are spectacular and the ride is about 2 minutes. The restaurant revolves and gives a panoramic view of the city, sunset is an time excellent to dine. HemisFair '68 was financed with a combination of public funds and private underwriting; however, it was not without controversy. Developing the 92.6-acre site required the demolishment of an entire neighborhood that generated much opposition. HemisFair architect O'Neill Ford would be relieved of his duties as primary architect because his plan was to save 120 of the historic homes, churches, and businesses that comprised this neighborhood. Fair planners were not pleased with his intentions, but Federal funding was released only after an amendment was passed that required them to save as many structures as possible; only twenty would be preserved. Another controversy swirled when Congressman Henry B. Gonzalez questioned the bidding process for the Tower and withheld Federal funding until the bids were re-offered. Finally groundbreaking took place on August 6, 1966. When the Tower opened to the public April 11, 1968 the fair had already been open for a few days. Construction materials and workers greeted visitors arrived at the top of the Tower. The concrete base was built from the ground up and the clubhouse built on the ground and then hoisted up to be secured in place. An interesting slide show of the construction can be found here. 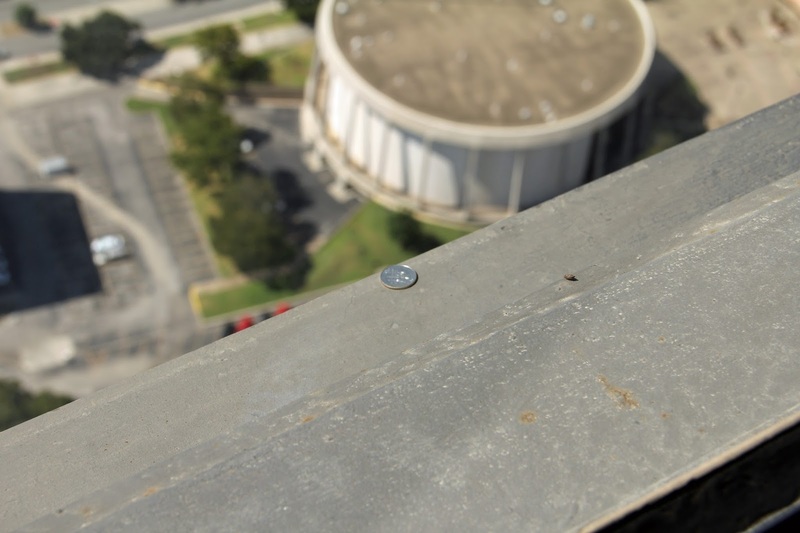 Need a dime? Not so easy as there is plexi-glass between you and it. The round building in the upper picture was the Confluence Theater during HemisFair and is now the John H. Wood Federal Courthouse. The observation level has both an inside area and one outside. Originally the outside area had only steel bars, but safety and weather concerns prompted the addition of high plexi-glass panels. Still, the wind can be fierce up there! After many years of enchanting visitors the Tower closed and underwent a major remodeling, re-opening in 2006. The current restaurant contract holder, Landry's, also added a gift shop and small cafe at ground level. Today's Tower of the Americas is very different in some ways, but still offers the same thrilling elevator ride and 360 degree view of a growing city.